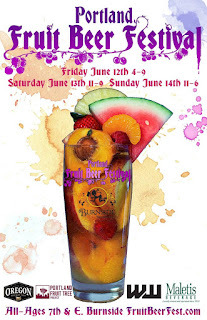 With less than 2 weeks remaining until the 5th annual Portland Fruit Beer Festival organizers are revealing the tantalizing beer list today as well as a first ever Fruit Beer Fest exclusive bottle release. Fruit of the Garden of Good and Evil is a collaboration between Burnside Brewing Co. and Reverend Nat's Hard Cider. This years festival features a 40% space increase by adding an extra space for more room, more beers and hard cider just west of the main festival lot on NE 7th and Burnside. 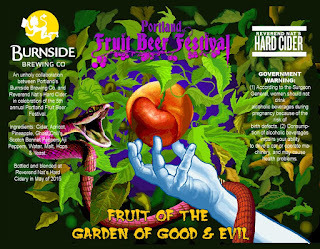 Exclusive Portland Fruit Beer Festival bottle release and beer from Burnside Brewing Co. and Reverend Nat's Hard Cider: Fruit of the Garden of Good and Evil. This unholy marriage of beer and cider is the ultimate temptation of luscious, juicy and tropical fruit character with notes of Pineapple and Apricot that pulls you in before ending in a firey tropical heat of Ghost Peppers, Scotch Bonnets and Aji peppers and a thirst quenching 4.5% (estimated) ABV. 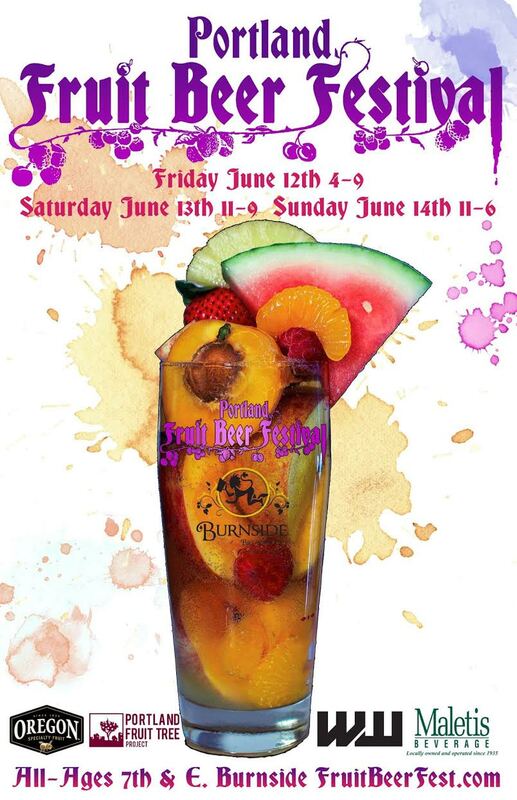 Available in 22oz bottles only at Burnside Brewing during the Fruit Beer Fest for $7 with limited draft poured at the festival, Reverend Nat's and special events. What do you get when you use wild lactobacillus from the skin of English apples to kettle sour a Gose only to blend that with Reverend Nat's Ciderkin Cider? A ridonkulously refreshing beer that hails from no place but the epic depths of our whacked out minds. 4.23% ABV enough IBU. The immortals waited six thousand years before gathering for this magnificent feast; the peach tree put forth leaves once every thousand years and it required another three thousand years for the fruit to ripen. Statues depicting Xi Wangmu's attendants often held three peaches. 3,000 years of life after the consumption of a single peach. 6.2% ABV 3 IBU. An unholy collaboration between Portland's Burnside Brewing Co. and Reverend Nat's Hard Cider in celebration of the 5th annual Portland Fruit Beer Festival. A blend of Cider, Apricot, Pineapple, Ghost Chili's, Scotch Bonnet Peppers, Aji Peppers, Water, Malt, Yeast and Hops. Elysian Brewing of Seattle, Washington and Payette Brewing of Boise, Idaho teamed up for the first time to brew this Northwest huckleberry sour. The beer is light, tart and bright freakin’ PINK! It’s brewed in the (mostly) traditional Berliner Weisse style, employs a grain bill of half wheat and half barley, is soured with Lactobacillus, and weighs in at a thirst quenching 2.8% ABV. Add to this a whopping two-and-a-half pounds per barrel of delicious Idaho-grown huckleberries and you have the perfect antidote for these hot summer days. A blend of Ex Novo Olde Ex Malt Liquor and fine orange juice. It puts the class in classic. 5.0% ABV. This otherwise classic franco-belgian style saison is infused with fresh squeezed ginger juice processed in house, oregon fruit apricot puree, and bitter orange peel, for a bright fruity saison with a cleansing ginger heat in the finish. 7.5 % ABV. Stone Free is a blend of a Brett fermented Berliner Weisse and a wine barrel aged sour golden ale aged on Cranberries and Ginger. It is deep pink in color with tart fruit, funky and bready aromas and a background waft of ginger. Stone Free has both sweet and tart flavors intertwined with mild spicy ginger and a crisp and dry tangy finish. 5.1% ABV. named in honor of the late B.B. King, is a straightforward beer with big flavors. Fermented in our open top tanks, the beer maintains a robust profile typical of the stout style with the addition of over 200 pounds of blueberry, adding one extra flavorful layer to the beer. Fresh Strawberries is a collaboration brew with Coda Brewing from Aurora, Colorado. Using Saison as a base, we added fresh strawberries and then kettle soured the beer with Lactobacillus to increase the tartness and balance out the sweetness from the fruit. French Sasion yeast allowed us to pull some subtle spicy notes in the aroma and flavor. 5.4 % ABV. Cider Riot: Hedgerow Fruits - plum and blackcurrant cider.